On Thursday, Environmental Protection Agency (EPA) chief Scott Pruitt submitted his resignation after an unprecedented number ethical scandals plagued his tenure. Pruitt, the former attorney general of Oklahoma, came under fire for excessive spending of taxpayer dollars for personal first-class travel, a condo rental from a Washington D.C. lobbyist, and the purchase of $43,000 soundproof phone booth for his own office. In addition, Pruitt was said to have ordered his staff to attend to his personal tasks, including finding a six-figure job for his wife, according to the Washington Post. 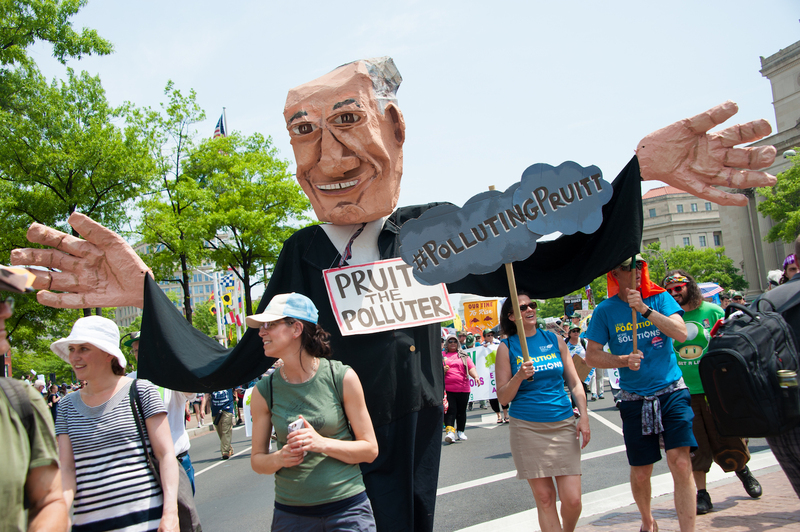 But beyond his appalling use of funds, Pruitt was more widely criticized for prioritizing oil companies and profit over the health of the planet and future generations. Just last week, a video went viral online of a young mother confronting Pruitt at a restaurant holding her young child and urging the EPA head to resign. “We deserve to have somebody at the EPA who actually does protect our environment, somebody who believes in climate change and takes it seriously for the benefit of all of us, including our children,” Kristin Mink told Pruitt to his face. As we reported, the initial appointment of Scott Pruitt to run the EPA infuriated environmentalists, as Pruitt time and time again denied the existence of climate change and questioned basic scientific facts about global warming. President Donald Trump’s decision to appoint Pruitt to run the EPA was widely viewed as a move to dismantle the organization and empower oil companies and fossil fuel suppliers. During his time at the EPA, Pruitt ordered that climate change information be scrubbed from the official website of the government agency. He also oversaw the repeal of Obama’s Clean Power Plan, which aimed to limit greenhouse gas emissions. In one interview, Pruitt even suggested that global warming might even be a good thing for the planet. Meanwhile, environmental advocacy group Environment America released their own response. “It took an endless stream of ethical lapses for Scott Pruitt to lose his job, but he never should have had that position in the first place, nor kept it as long as he did, given his actions to undermine core environmental protections such as clean air and clean water,” said Christy Leavitt, the senior director of Environment America’s Campaign to Defend Our Environment.